Glass can make a beautiful and modern looking table top. Typically the glass table top is placed on a wood or metal frame. To make the table you must cut a large piece of glass to fit the table frame. Many people are afraid of cutting glass. However, cutting a large piece of glass does not have to be scary or intimidating. The process is simple and requires only a few tools. Learn how to properly cut your glass table top to size for best results. A glass table is a functional addition to any home or apartment. Determine how big the table top needs to be. When you know this you will know where you need to cut the glass. 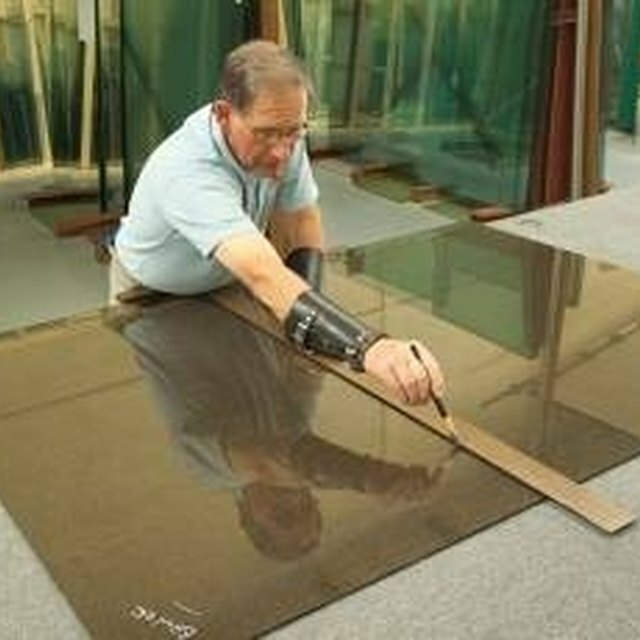 Write the measurements down and then transfer them to a large piece of glass. Place the large piece of glass on a big flat surface. If you can set the glass on a large counter top or table, that would be the best solution. Score the glass with a diamond point glass cutter. Place a large steel cork-backed ruler along the line where you are going to cut the glass. Hold the ruler firmly and use it as a guide to score the glass with the diamond point glass cutter. Position the large sheet of glass so the score line is lined up with the edge of the counter top or table. The larger area of glass should be on the table while you hold the other part of the glass with both hands. If the glass sheet is very large you may need to have a friend help you hold the glass in place. Lift the glass sheet slightly and then lower it to break the sheet in half along the score line. Smooth the cut edge of the glass by grinding it on a grindstone. You can also rub the edge with a whetstone and a small amount of water.